Cornwall Beach, the county is rightly well known for its beaches. 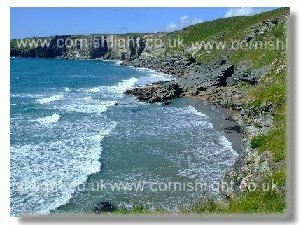 Whether you are down here on a beach holiday Cornwall and looking for a beach to take granny and the kids with easy parking and likely safe bathing, or are more energetic and fancy a Cornish Coast Path Walk thrown in, here's a few ideas for you. 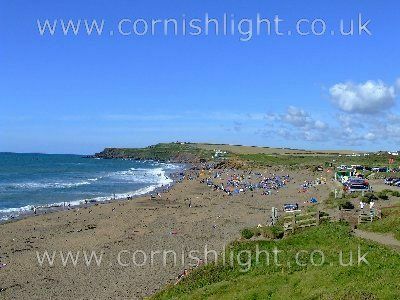 From Newquay's Fistral, like Polzeath a favourite for Cornwall Surfing, to Porthmeor Beach St Ives, or Bude's Crooklets Beach, both popular with families. To beaches off the beaten track hidden down narrow lanes, often accessible only on foot. Beach Safety. 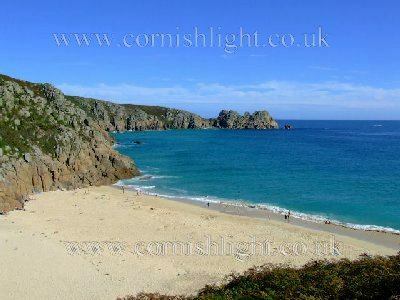 Porthcurno Only 4 miles east of Lands End is one of the most strikingly beautiful beaches in Cornwall. Nestling under granite cliffs, themselves a mass of wildflowers in spring. The beach often has a crystal clear sea and golden sand and is a south facing suntrap. Porthcurno with the Minack Theatre to the west has a large car park a short walk down a level path behind the beach, so is the more accessible to families. In season lifeguards are usually on duty. The beach sometimes has undertows and rip tides in certain conditions, so take heed of the warnings, don't swim alone. The coast from Newquay and stretching as far as Bude and the County border boasts some particularly fine beaches, offering huge expanses often backed by sand dunes, many with easy parking nearby. Mawgan Porth, Watergate Bay, Constantine, Trevone and Perranporth to name but a few. More nice beach pictures. Trebarwith Strand 3 miles from Tintagel. The beach has Gull Rock as a backdrop, a huge expanse of sand at low water and lots of rock pools for the kids to explore. Parking nearby, and life guards on duty during the Season. Trebarwith bears witness to many spectacular sunsets over the Atlantic Ocean, particularly on an evening high tide. Equally impressive is watching a winter storm raging- keeping safe distances back of course. Tregardock. Lonely, unspoilt, very off the beaten track, one of the most isolated beaches in Cornwall- On the North Cornwall Coast, between Tintagel and Port Isaac - reachable by a half mile walk from the nearest road, with a long haul down a steep and windy cliff path, followed by a scramble over rocks, in total a descent of over 400 metres, is this real gem of a secluded low tide beach. With a wide expanse of sand when the tide is out, rock pools for the kids to explore, mussels galore clinging to the outcrops, some creating the most amazing patterns. Even in peak season, only a few adventurous souls, and the most determined of surfers- did he really carry that long board all the way down that path? No lifeguards, do not enter the water unless you are very experienced and sure that local conditions are safe. Beware of the incoming tide and the rip currents that rage along this isolated and so beautiful coast. West facing , witness to so many spectacular sunsets- sit on the grassy slopes taking it all in. In winter waves crashing below during a storm. Nearby parking is at best limited at worst non existent, the people that live in the farmstead must have the patience of a saint, so please show them courtesy and park considerately or elsewhere and walk in along the Coast Path. Widemouth 4 miles along the Coast from Bude. A huge 2 mile long sandy beach, with plenty of car parking right behind it. Popular with surfers and families too. Tuition and board hire. A place for all the family. Life guards on duty in Season. Please take heed of the warnings and swim where indicated by the flags. Keep out of the water near the rocks. Like Trebarwith scene of spectacular sunsets. Duckpool 3 miles North of Bude, near to Kilkhampton. A large beach with some small pebbles. In a beautiful setting. Like nearby Sandymouth reached down narrow country lanes with high hedges. Rarely busy, hidden in at the mouth of a deep valley, with a stream running down it. Warning signs say swimming is dangerous at all times because of currents and rocks- though foolhardy surfers sometimes ignore this advice at their peril. Well worth a visit for the peace and quiet. Watergate Bay 3 miles north of Newquay. One of Cornwall's more spectacular rural beaches with 2 miles of golden sand at low tide backed by 300 foot cliffs. There is car parking right behind the beach, shop facilities, food is available too. One of Cornwall's gems. In season surfing tuition from qualified instructors. For beginners, intermediates and advanced surfers. Watergate Bay is an excellent destination for a brisk walk with a purpose. It is about an hour's walk along the Coastal Path north from Newquay. Lifeguards on duty in Season. Fistral Beach Newquay is indeed spoilt with several of the best surfing beaches in Cornwall. Fistral facing the Atlantic is very popular with surfers of all abilities. Venue for International Surfing Competitions. Like Watergate Bay and many other Cornish surf beaches surfing tuition is available from Professional Coaches. Several areas are kept for swimmers alone. All Newquay's beaches are popular with families. Most have nearby car parking and lifeguards on duty in Season. Crantock. Mention must first be made of the unspoiled Rame Peninsula, that stretch of Coast between Looe and Plymouth Sound. Some say the forgotten corner of Cornwall, with some wonderful beaches. Whitsands and Sharrow Bay popular with surfers. Portwrinkle and Downderry hidden under cliffs. Lantic and Lantivet Bays real gems, two of three south facing sandy beaches hidden in a Bay mid way between Polperro and Fowey, reachable by a stiff 2 mile walk from the nearest road, with lots of steps. The Bay is popular as a mooring with yachts hopping along the Cornish Coast. South facing beaches. None are ever busy due to their inaccessibility. Well worth the walk for the sheer beauty and isolation of the three beaches. Gorran Haven Near St Austell. Beautiful East facing beach sheltered by the Harbour walls. A wide expanse of sand at low water. Often lots going on. Popular as a launch for dive boats. If you are there at the right time of year gig racing. Car parking a few minutes away in the village. Follow the coastpath west for the unspoilt beaches of the South Cornish Coast from Gorran towards St Anthony Head- Towan, Pendower, Hemmick, Vault, and Porthluney, with its backdrop of Caerhays Castle. 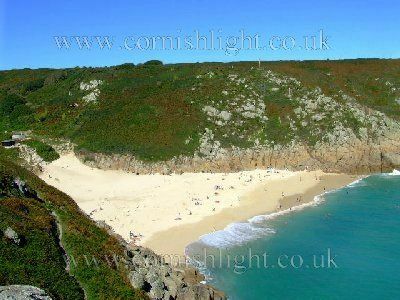 There are tens if not hundreds of beaches in Cornwall, only a few are mentioned here. Part of the delight of a Cornish Holiday is just maybe if your are lucky finding a beach all to yourselves.